I am happy to share you the state of the art design of big mother ship - an exode ship to save 46 kerbals with a big storage room for long travels. This strong full stock ship is able to reach by itself - kerbin orbit and WITHOUT ANY REFUELLING capable to reach moons and DUNA ORBITS. Abord -> Emergency moduls separation and parahchutes activation. PS: Because kerbal designer are never 100% sure, a state of the art emergency technology permit to save the 3 kerbal in the command modul at almost any times. 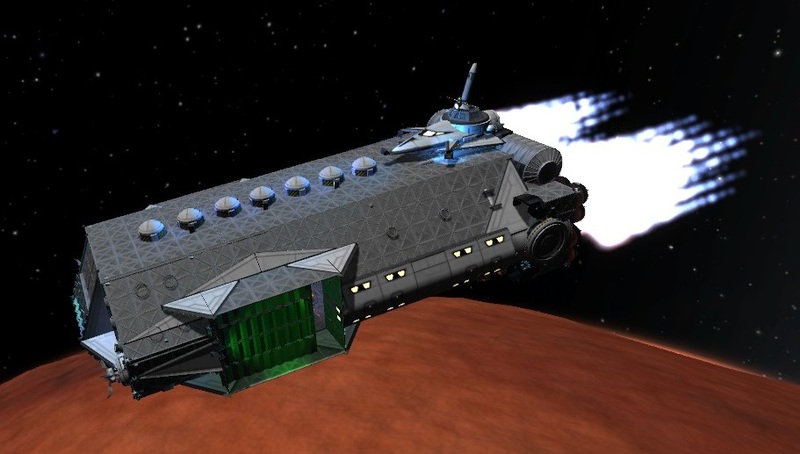 PS2: Please make some comments to give me ideas about how improve the ship ! Pretty cool. I just cant seem to get it off the launch pad!! For information, in construction menu, first kerbals are always put in the main command pod at the upper side of the place list. @Everyone : Coming soon, the 3.0 version of the mother ship with a brand new design. Please tell me any ideas you have to make the mother ship better !! Really cool ship, but I have one problem, were exactly is the main command pod?